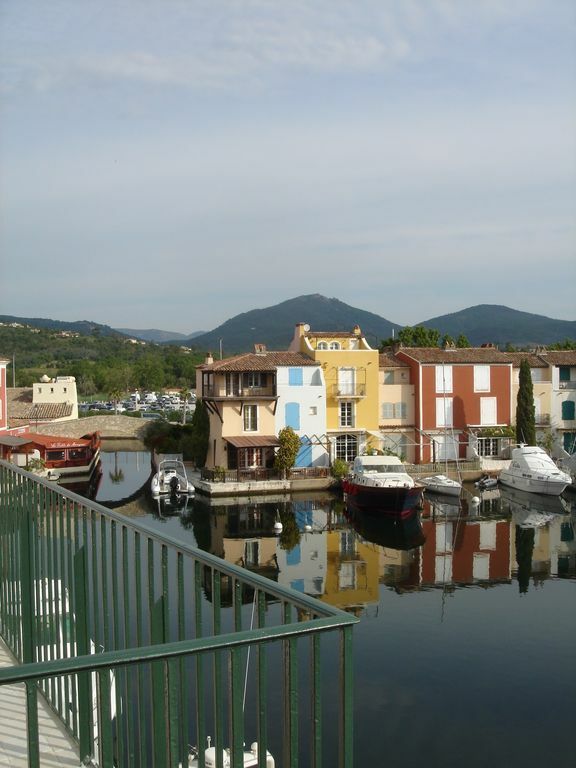 In the Gulf of St Tropez, beautiful apartment in the heart of the lakeside town of Port Grimaud, view on the canals and boats from the bedrooms and living room. It is spacious and bright, crossing, view on 3 sides, two small balconies decorated rooms. Fully equipped kitchen, washing machine and dishwasher. You can do your market and play bowls on the main square. The beach and water activities are 5 minutes walk. Called 'the Venice of Provence', Port Grimaud will seduce you with its network of canals, houses with pastel colors, squares, gardens and unique architecture. The boats on the canals are a feast for the eyes. A bathroom with shower and two sinks. A separate W. C.. Thank you for your stay. You are welcome any time. The apartment is in the most perfect location - on the edge of the Market square, with views of the water and the church. Sitting on the balcony people-watching in the sun was paradise. The apartment is very well presented, typically French, but very well appointed. Christina could not have been more helpful or easy to deal with. It was such a pleasure to be in contact with Catherine who is a very pleasant and friendly person. I would be so pleased to welcome her for a next stay. We have had a fabulous two week stay at this lovely apartment. The apartment is situated in the main market square of the beautiful Port Grimaud. When we arrived at the apartment we drove into the main square to unload and we were met by the very helpful local agent. We took our luggage up to the second floor to the apartment and then moved the car into the secure residents car park across the road from Port Grimaud. The apartment location is superb with three aspects overlooking fantastic views of the waterways of the village. The whole apartment and its three bedrooms were lovely with traditional Provencale furnishings. We particularly enjoyed the totally free access to the residents boat service which continually runs around Port Grimaud and the beautiful beaches. We were at the apartment when there was a heat wave in Southern Europe and whilst the apartment has new shutters to all windows and the small terraces, and some portable fans, it was very warm in the apartment as there is no air conditioning. We had a lovely family holiday in this nice apartment and highly recommend it. With great plesure to welcome you. We rented this apartment for a two-week holiday break at Côte d'Azur. This was our second time in this apartment in Port Grimaud. We really like our stay: the apartment is spacious, nicely located at a lovely little market square. And it offers a nice view from the little balcony where we enjoyed breakfast in the morning. Parking your car is not a problem, and the area around the apartment offers many choices for restaurants and even a little convenience store. Great and clean apartment, full equipped kitchen, great location. Bedlinnen that is offered could use an update though. Located in the main square this is a central location to explore from. The apartment itself is on the second floor and it is worth bearing in mind that there are several flights of stairs to ascend. We went with our 14 month old who particularly enjoyed the space in the apartment. The layout was good and the living room is a decent size with a dining room off the kitchen which is useful for those wishing to self cater. The apartment itself has a rustic feel and it is worth noting that there is no air conditioning although this was not a problem when we stayed. The views are good and one of the bedrooms has a little balcony where you can sit and enjoy a drink in the evening. The apartment is 5 minutes walk from the beach of Port Grimaud. Other picturesque beaches in the immediate vicinity await you: Gigaro, Escalet, La Croix-Valmer ... (10-15mins drive). St Tropez is 6km. To get to Port Grimaud nearest highway exit: Le Muy or Le Luc. SNCF railway access Fréjus St. Raphael 40km. Airport: Nice. Caution à verser à l'arrivée 300 euros par chèque, restituée après état des lieux de sortie. Location de linge possible (draps serviettes de bain) en option + 20 euros par personne pour le séjour,à régler sur place, en espèces, jour d'arrivée Ménage fin séjour + 70 euros, à régler en espèces, jour de l'arrivée. CAUTION DEPOSIT 300 euros arrival day, given back day of departure after check of apartment. If you need bedlinen & towels, extra cost of 20 euros/person/stay ENDCLEANING is not an option, + 70 euros, day of arrival.